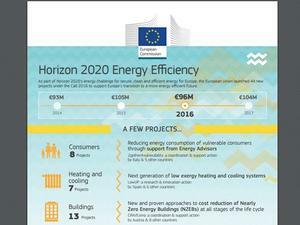 40 new projects have been funded under the Energy Efficiency Call for Proposals 2016 as part of Horizon 2020’s energy challenge for secure, clean and efficient energy for Europe with a total budget of €96M with the aim at helping vulnerable consumers, improve heating and cooling systems, reduce costs of nearly-zero energy projects through innovative financing tools and stimulate capacity building among local authorities. A description of each project, the budget allocated, their objectives and the members of their consortia can be found in our Energy Data Hub and the infographic of EASME illustrates the number of projects per area as well as some examples such as 2gether4vulnerability - the project which aims to support vulnerable consumers. 2gether4vulnerability coordinated by AISFOR started on May 1st 2017 and has a 3-year work plan intends to train a specialised energy advisor to properly address and support vulnerable consumers / energy poor with their domestic energy consumptions.